As I described in detail in the article on Jugendstil or Art Nouveau in Vienna, the Austrian art scene of the late 19th century was dominated by historicism and conservative styles. This applied in particular to Vienna′s pro-Habsburg, pro-Catholic aristocracy. Given the amount of construction that went on during the "Gründerzeit" or founder′s age (second half of the 19th century, a period of an enormous economic boom), it is quite remarkable how reluctant Austrians were to be open for modern styles in art and architecture. The conservative mainstream, however, also provoked an anti-mainstream response. This response fiercely echoed the dominance of conservative styles: Jugendstil, expressionism and other modernist schools that started to attack the mainstream after approximately 1890 (for details, see my article on the Wiener Moderne). In architecture, one of the most influential figures was Adolf Loos. Like no other, he is still considered to be the founder of both, modern architecture in Austria and a distinct school of very plain and "un-ornamented" buildings. Personally, I am not a very big fan of Adolf Loos, but I do acknowledge his importance and appreciate (and share) his disgust regarding the pomposity of the Ringstraße and historicist culture. 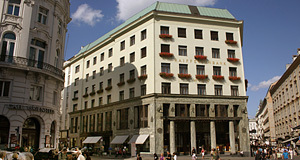 Adolf Loos was born in 1870 in Brünn (now Brno in the Czech Republic). His father was a mason, thereby exposing him to work with stones from an early age. Loos′ young life was rather unconventional: He studied at the Technical University in Dresden, served in the army, moved to the US in 1893 and lived there for three years, doing mostly menial jobs. In 1896, he moved to Vienna and settled as an architect and journalist. His architectural work consisted mostly of interior designs; as a journalist, he was more successful, writing critiques for the "Freie Presse" (in my opinion still Austria′s best daily paper) on matters that were relevant to architects and designers of interiors. In 1908, he published his most famous pamphlet: "Ornament und Verbrechen" ("Ornament and Crime") in which he attacks both the historicism that dominated those days and the Jugendstil with its floral designs and attempts to expand the concept of art to all sorts of things, including items for daily use (think of decorated mirrors, furniture, vases of Art Nouveau). Adolf Loos opposed it by arguing that functionality and art should be divided and that art should be constrained to fine arts. This was just the opposite of what the "Wiener Werkstätten" or "Vienna Workshops" did. Loos′ designs, on contrast, were non-ornamental and plain, but used expensive materials that were applied in generous amounts: Brass, marble and other valuable stones, exotic woods like teak. In combination with Loos′ popular - and often controversial - articles in the "Freie Presse", he had soon built up quite a reputation. He was friends with many important intellectuals of his days: Karl Kraus, Oskar Kokoschka, Arnold Schönberg or Peter Altenburg. He was part of Vienna′s modernist circles, which were closely connected with the city′s remarkable café culture. Continue with: "Adolf Loos - Part II"